The story of the death, in sinister circumstances, of the boy-king Edward V and his younger brother Richard, Duke of York, is one of the most fascinating murder mysteries in English history. It is a tale with profound moral and social consequences, rich in drama, intrigue, treason, scandal and violence. In this gripping book Alison Weir re-examines all the evidence – including that against the Princes’ uncle, Richard III. She brilliantly reconstructs the whole chain of events leading to their murder and reveals how, why and by whose order they died. I’ve been meaning to read The Princes Of The Tower for quite a while, so it’s about time I actually read it! I liked it but not as much as I thought I would. As much as I love Weir, it’s a book you need to go into with some knowledge of the time period and the people. I’ve read several books about the Tudors, but I know very little of the events that led to the Tudors taking the throne, so for a few chapters, I felt really confused by all of the names and events. It definitely felt like Weir set out to prove that Richard III was the one behind the mysterious murders of the two Princes, and it did feel like Weir didn’t go into this as objectively as one would think. She does make some good points, and Richard III does seem like the likeliest suspect, but I don’t know that he’s as evil as Weir would make him out to be. Still, it’s a really good overview of the time, and the events that led to the reign of Henry VII. There is quite a bit of information, and I like that Weir mentions sources from that time period. I did get the sense that there’s not a lot we know, and that some of the sources may be sketchy. Still, with some of the things that have come out over the last few years, with the discovery of Richard III’s grave, I’d be curious to see a more updated book. 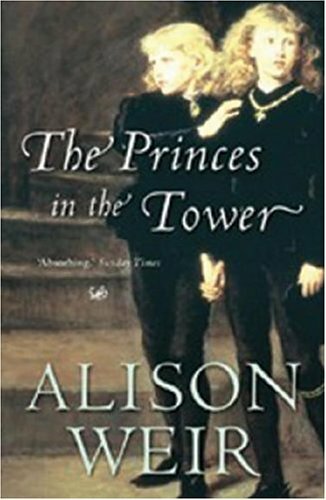 The Princes In The Tower was an interesting read, and it’s a good overview of the time. It did seem slightly biased against Richard III and it’s not the best for people who aren’t super familiar with the time period. It still has some interesting things to think about. The Princes In The Tower get 3 stars. Did Weir consider anyone else as the potential culprit (even if she dismisses them)? Curious to know what other theories she considered. She mentioned someone in passing as a possibility (and I wish I could remember who), but dismissed it pretty quickly. It did seem more focused on Richard III and she didn’t really bring up who it couldn’t be.